In order to hit targets farther than distance 1, you need to play a bigger weapon: place it over the Colt .45. Weapons can be recognized from their blue border with no bullet holes, black-and-white illustration and the number into the sight (see picture) that represents the maximum reachable distance. The weapon in play substitutes the Colt .45, until the card is removed somehow. Even if weapons are played on the board, they can still be stolen (e.g. through the play of a Panic!) or discarded (e.g. through Cat Balou). The only weapon you can never lose is the ol' Colt .45! You can only have one weapon in play at a time: if you want to play a new weapon when you already have one, you must discard the one you already have. Important: weapons do not change the distance between players. They represent your maximum reachable distance when shooting. With this card in play you may play any number of BANG! cards during your turn. These BANG! cards can be aimed at the same or different targets, but are limited to a distance of 1.
b) if your weapon is capable of reaching that distance. Example 1: With reference to the distance figure, let us suppose that Ann (A) wants to shoot Carl (C), i.e. Ann wants to play a BANG! card against Carl. Usually Carl would be at a distance of 2, therefore Ann would need a weapon to shoot at this distance: a Schofield, a Remington, a Rev. Carabine or a Winchester, but not a Volcanic or the ol' Colt .45. If Ann has a Scope in play, she would see Carl at a distance of 1, and therefore she could use any weapon to shoot at him. But if Carl has a Mustang in play, then the two cards would combine and Ann would still see Carl at a distance of 2. Example 2. If Dan (D) has a Mustang in play, Ann would see him at a distance of 4: in order to shoot Dan, Ann would need a weapon capable of reaching distance 4. If you are hit by a BANG! you may immediately play a Missed! - even though it is not your turn! - to cancel the shot. If you do not, you lose one life point (discard a bullet). Discarded bullet go into a pile in the middle of the table. If you have no more bullets left, i.e. you lose your last life point, you are out of the game, unless you play immediately a Beer (see next paragraph). You can only cancel shots aimed at you. The BANG! card is discarded, even when cancelled. This card lets you regain one life point - take a bullet from the pile. You cannot gain more life points than your starting amount! The Beer cannot be used to help other players. out of turn, but only if you have just received a hit that is lethal (i.e. a hit that takes away your last life point), and not if you are simply hit. Beer has no effect if there are only 2 players left in the game; in other words, if you play a Beer you do not gain any life point. Example: You have 2 life points left, and suffer 3 damages from a Dynamite. If you play 2 Beers you will stay alive with 1 life point left (2-3+2), while you would be eliminated playing only one Beer that would allow you to regain just 1 life point. You would still be at zero! Cards with symbols on two lines have two simultaneous effects, one for each line. Here symbols say: "Regain one life point", and this applies to "All the other players", and on the next line: "[You] regain one life point". The overall effect is that all players in play regain one life point. 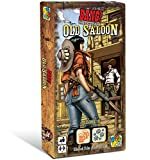 You cannot play a Saloon out of turn when you are losing your last life point: the Saloon is not a Beer! 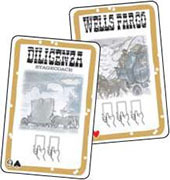 Symbols state: "Draw two cards" (three with Wells Fargo) from the top of the deck. When you play this card, turn as many cards from the deck face up as the players still playing. Starting with you and proceeding clockwise, each player chooses one of those cards and puts it in his hands. The symbols state: "Draw a card" from "a player at distance 1". Remember that this distance is not modified by weapons, but only by cards such as Mustang and/or Scope. Force "any one player" to "discard a card", regardless of the distance. The Gatling shoots "a BANG!" to "all the other players", regardless of the distance. Even though the Gatling shoots a BANG! to all the other players, it is not considered a BANG! card. During your turn you can play any number of Gatling, but only one BANG! card. Each player, excluding the one who played this card, may discard a BANG! card, or lose one life point. Neither Missed! nor Barrel have effect in this case. With this card you can challenge any other player (staring him in the eyes! ), regardless of the distance. The challenged player may discard a BANG! card (even though it is not his turn!). If he does, you may discard a BANG! card, and so on: the first player failing to discard a BANG! card loses one life point, and the duel is I over. You cannot play Missed! or use the Barrel during a duel. The Duel is not a BANG! card. BANG! 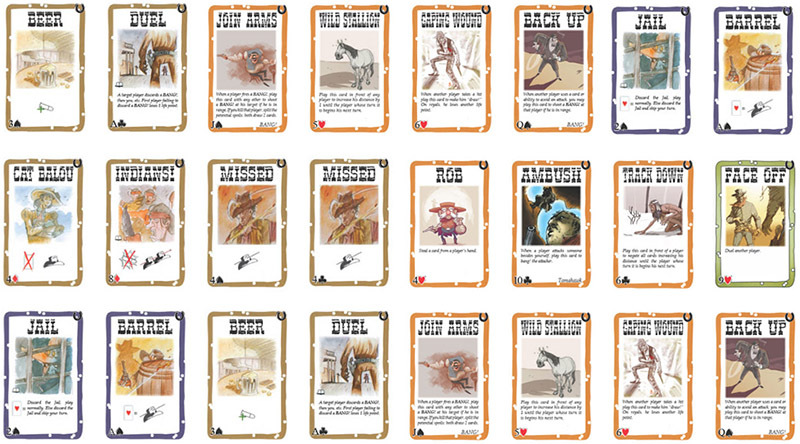 cards discarded during a Duel are not accounted towards the "one BANG! card" limitation. When you have a Mustang horse in play the distance between other players and you is increased by 1. However, you still see the other players at the normal distance. Example: In the figure of the distance, if Ann (A) has a Mustang in play, Ben (B) and Flo (F) would see her at a distance of 2, Carl (C) and Emma (E) at a distance of 3, and Dan (D)) at a distance of 4, while Ann would continue seeing all the other players at the normal distance. When you have a Scope in play, you see all the other players at a distance decreased by 1. However, other players still see you at the normal distance. Distances less than 1 are considered to be 1. Example: In the figure of the distance, if Ann (A) has a Scope i in play, she would see Ben (B) and Flo (F) at a distance of 1, Carl (C) and Emma (E) at a distance of 1, Dan (D)) at a I distance of 2, while Ann would be seen by other players at a ) normal distance. Some cards (Barrel, Jail, Dynamite) show little poker suits and values, then an equal sign and then their effects. The player using such a card must "draw! ", i.e. he has to flip over the top card of the deck, discard it, and look at the poker symbol in the lower left corner. If this flipped card shows a symbol (and value!) that matches, then the "draw!" was successful, and the effect of the card is resolved (the "draw!" card is always discarded without effect). Otherwise, nothing happens: bad luck! If a specific card value or range is specified on the card, then the "draw!" card must show a value within that range (including the pictured symbols), and the suit shown. The value sequence is: 2-3-4-5-6-7-8-9-10-J-Q-K-A. Example: You are the target of another have a Barrel in play: this card lets you BANG! and it is successful on a Heart. So, of the deck and put it on the discard pile: it's a 4 of Hearts. The use of the Barrel is successful and cancels the BANG! If the flipped card were of a different suit, then the Barrel would have had no player's BANG! You "draw!" to cancel a you flip the top card effect, but you could have still tried to cancel the BANG! with a Missed!. otherwise discard the Jail and skip your turn. If you are in Jail you remain a possible target for BANG! cards and can still play response cards (e.g. Missed! and Beer) out of your turn, if necessary. Jail cannot be played on the Sheriff. Play this card in front of you: the Dynamite will stay there for a whole turn. otherwise, pass the Dynamite to the player on your left (who will "draw!" on his turn, etc)..
Players keep passing the Dynamite around until it explodes, with the effect explained above, or it is drawn or discarded by a Panic! or a Cat Balou. If you have both the Dynamite and a Jail in play, check the Dynamite first. If you are damaged (or even eliminated!) by a Dynamite, this damage is not considered to be caused by any player.